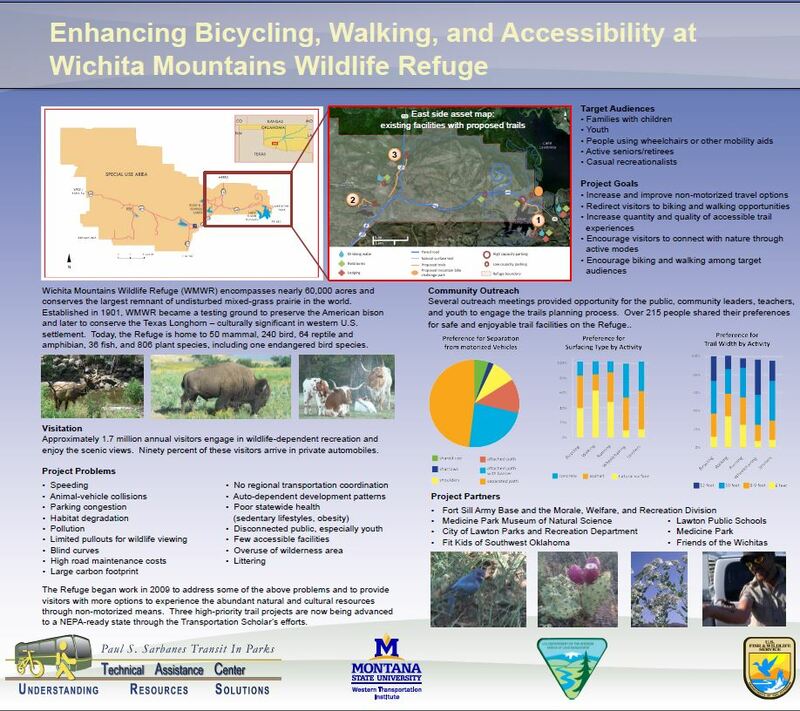 The purpose of this project was to create a plan for a multi-use transportation network for the Wichita Mountains Wildlife Refuge, which would encourage visitors to use alternative modes of transportation. The Wichita Mountains Wildlife Refuge (WMWR) receives more than 1.6 million visitors per year, making it one of the most heavily visited refuges in the National Refuge System. The vast majority of visitors arrives at and tours the Refuge via private automobile. There is a need to improve the quality, capacity, and safety of the Refuge driving experience, by encouraging visitors to decrease their use of fossil fuels and increase their physical activity and fitness through use of alternative modes of transportation such as bicycle and foot travel. The purpose of this project was to create a plan for a multi-use transportation network that would encourage visitors to use alternative modes of transportation. A Transportation Scholar worked with the Refuge and USFWS staff to develop a well-defined scope of work and NEPA ready project proposal.